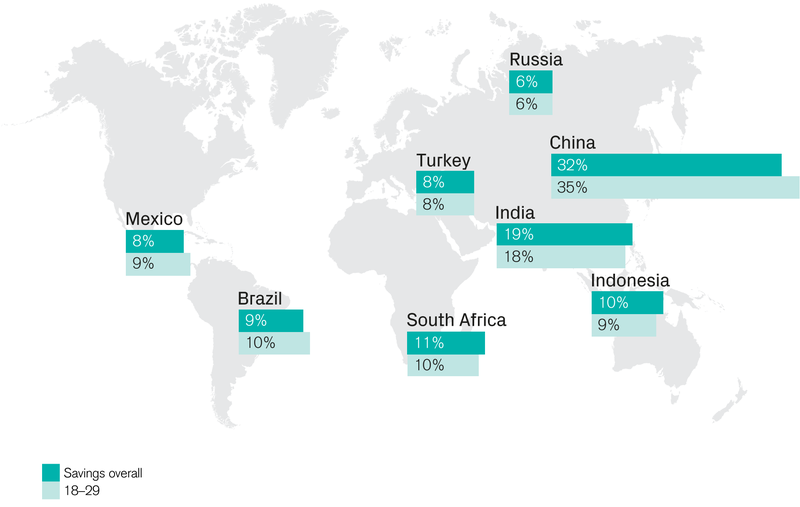 The Emerging Consumer Survey by the Credit Suisse Research Institute examines for the first time the savings patterns across the eight countries in focus: Brazil, China, India, Indonesia, Mexico, Russia, South Africa, and Turkey. China's savings rate stands out in comparison to its peer countries, while India sees a clear shift in the savings channel moving away from saving via gold and property. Emerging markets remain the fastest source of wealth accumulation. Between 2000 and 2017, they have nearly doubled their share of global wealth from 11% to 19%, with China being the key driver of this growth. Looking out to 2022, the annual rate of increase in wealth is projected to be 6.5% for emerging markets versus 3.3% for developed markets. China alone is expected to add a total of USD 10 trillion to the stock of global wealth in the next five years. Naturally, such fast wealth accumulation has had an impact on the way in which wealth is held as well as having powerful implications for savings markets. Given the wealth accumulation that is projected for emerging markets, there may be major implications for financial institutions and markets. China's savings rate stands out in comparison to its peer countries (32% versus the emerging markets' average of 14% as a share of income). 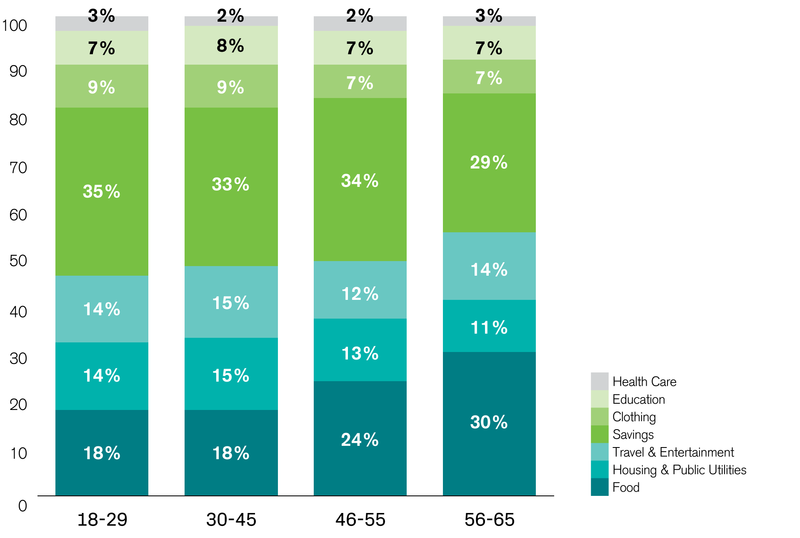 This trend is consistent across age groups, with the youngest cohort (18-29 year-olds) putting aside as much as 35% of their total monthly expenditure into savings. Such a precautionary approach to savings may reflect the consumers' concerns over a limited social safety net. In the majority of the surveyed economies, a bank account is the most popular savings channel. However, the level of sophistication in savings differs across countries with China, India and South Africa more readily making use of savings channels beyond just bank deposits, such as life insurance and mutual fund products. Observing the holdings of financial assets as a proportion of total wealth in emerging markets, the result is still well behind global levels. This is particularly visible for India where only 14% of wealth is held in financial assets compared to the global average of over 50%. However, the survey shows a clear shift in savings behavior of Indian consumers. The percentage of households that save via gold and property has dropped to 31%, the lowest level since 2010 when the survey started. On the other hand, the percentage of households investing in equities and mutual funds has risen to 19%, also the highest since the survey started. The results of our survey may well be a sign of an inflexion point in Indian behavior that could suggest a sizeable re-allocation of assets. 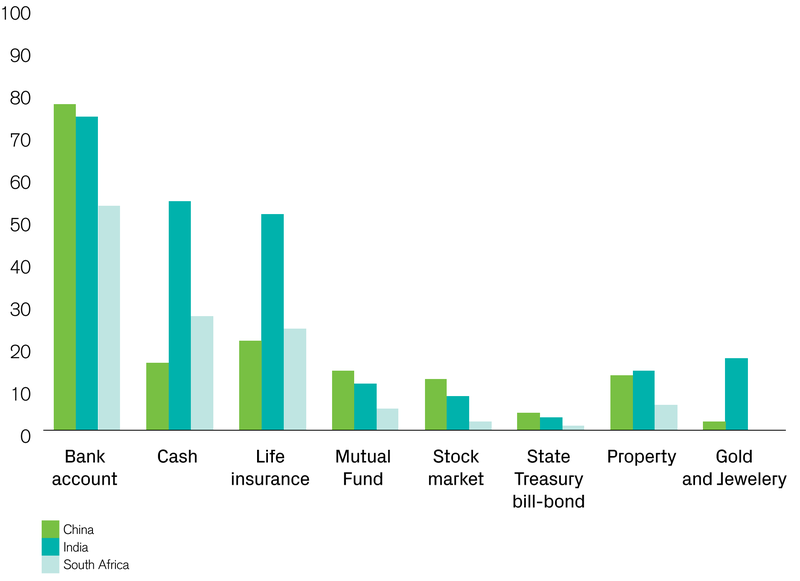 Should we see the allocation of wealth to financial assets alongside the substantial increase to wealth projected in the likes of China and India, the flow of new money to financial assets would be considerable.